In the course of the division of locomotives between the different PKP group companies in May 2008 all SU46 locomotives were left with PKP Cargo S.A. In this way PKP Przewozy Regionalne sp. z o.o., and most importantly PKP InterCity S.A. were deprived of a large number of vehicles perfectly suitable for passenger traffic on non-electrified lines. Currently (March 2015) PKP Cargo S.A. still maintains 14 such locomotives in working order, which are used not very intensively in 3 PKP Cargo S.A. divisions: Dolnośląski in Węgliniec, Wschodni in Lublin and Północny in Olsztyn, of which only the Wschodni Zakład Spółki still offers its locomotives to PKP Intercity S.A. in order to haul passenger trains from Lublin to Rzeszów Gł. and from Zamość to Rzeszów Gł. Unfortunately bearing in mind the current rolling stock strategy of PKP InterCity S.A. (hiring Czech locomotives class 754 „Diver” before purchasing new 111Db „Gama” diesel locomotives), 2015 may be the last year in which SU46 locomotives could be seen at the head of passenger trains. The element which spoils the end effect of the EU07 model by Piko the most are its headlights which are filled with incorrect white discs placed around a miniature glowing hole. It seems that even replacing these with silver discs, as proposed by Piko in the EU07-348 model does not make things better. In a short article Marcin Kapica presents a way to correct these shortcomings of the model in an easiest possible way, in order to make it look more like the full scale EU07-193. Apart from creating realistically looking „mirrors”, he proposes also to paint and fit the cab with window heating elements and a speedometer, especially bearing in mind the fact that the cab is lit making these elements even more visible. The work is completed by adding painted air hoses and an imitation of a screw coupling to the bufferbeam. You will be able to judge the final effect both against the original locomotive and the crude Piko model. The „Wróblewice” layout is an intermediate solution between the “fully fledged” layout modules and in-house „birthday cakes”. Its track layout was constructed on folding panels which makes it possible to run trains on a realistic station and a neatly lead closed loop of a double track mainline and an additional „local” loop in a completely independent way which does not require shunting, making it attractive both at home and when presented to a wider audience at fairs and exhibitions. An additional advantage of the layout is the possibility to add layout modules to it. We would like to present a set of experiences arising from the constructing, enlarging and many years of operating the layout both at home and at model exhibitions, hoping that it may inspire and help to make decisions related to the construction of model infrastructure. 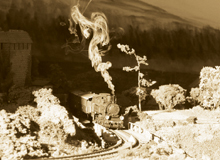 The presentation of the layout is complemented by artistic images of the layouts numerous railway-themed little corners, evoking an authentic spirit of the golden age of railways, which add a unique character to the layout – a character of a layout with a soul. 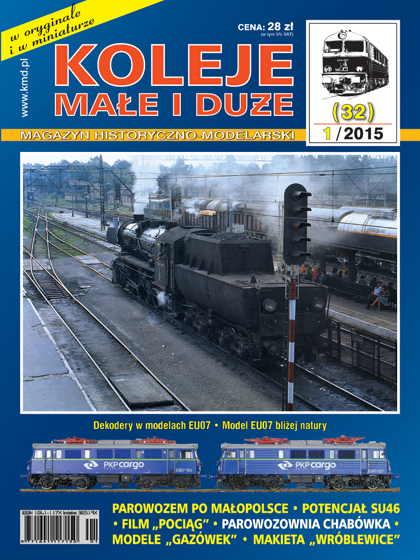 Polish language, 210 x 280mm, 78 colour pages, 1 fold out poster – SU46-054 with a passenger train on the impressive cantilever bridge on the river San.